I wouldn’t be the man that I am today without my incredible Dad. Nor would I be the man that I am today without my two incredible sons Eli and Isaiah. I am also blessed to know an elite group of fathers that have to live through the reality of childhood cancer. These men have to navigate a life that has been turned completely upside down. Trying to find a way to be there for their families while they balance their work demands. Being strong for their wives while the stresses of the situation tear at their own guts. Making sacrifices, financially and otherwise, to do whatever it takes to make their child well. Trying to be there for their other children, both physically and emotionally. Most of all, hugging and kissing their babies while telling them that everything is going to be okay, and in their hearts having no idea if that is true at all. This is a brotherhood I never thought I would experience, but it is one of real loyalty and strength and it has provided me with amazing bonds that I am so thankful for. Happy Father’s Day to everyone, but especially to those that have given up so much of themselves to help their children Beat Cancer. I am blessed to know a lot of amazing moms (my own being at the top of that list), but I have a special affinity for those moms I know that have carried Emla in their purse, that have carried a puke bucket under their stroller, that have had a whole shelf in the fridge dedicated to their kid’s medicine, that have used press and seal to cover an accessed port so their kid can take a bath, that can unscrew and deair a syringe of saline with one hand, or that have to spend Mother’s Day imagining what their son or daughter would be like if they were still alive. These moms are my heroes, but I would give anything for there to be less of them in the world. Happy Mother’s Day to everyone, but especially to those who have given so much of themselves to help their children Beat Cancer. Another update drought. Another post submitted just because there is something going on that needs to be publicized. This seems to be my new Modus Operandi. I guess I’m just not sure what is really different now than how things were in January. Eli’s still physically gone. We still miss him so much that many times our chests feel like an elephant is standing on them. Everything we see reminds us of him and we have to resort to videos (boy do I wish now that I had taken more videos) if we want to hear his voice again. Isaiah expresses many of Eli’s mannerisms, expressions and behaviors, which is both a joy and torture at the same time somehow as it makes us miss Eli all the more. 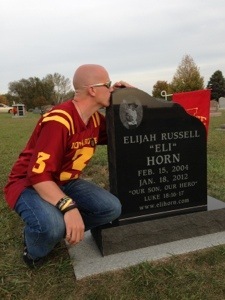 Tailgating at an Iowa State game is such a mixture of emotions because it brings back great memories, but hurts to see all of the young boys playing catch with the football before the game and Eli not being one of them. There are good things as well, of course. Comments from people about how their lives were positively impacted by Eli and his life (please keep those coming). Remembrances being created so others can learn about him and his impact on the world. One such remembrance (the playground structure near the football stadium that I posted about last time) is soon going to be a reality, thanks to all of you. Within about 12 hours of posting the need for $5k for the playground structure, that goal was reached, plus a little more. It didn’t really surprise me since I know how amazing Eli’s Army is, but I’m sure the City of Ames would be surprised to know how many donations came from other states like New York, Indiana, Missouri, and so many others. 🙂 Another good thing is the inspiration he caused in others to raise money and awareness for Childhood Cancer. Since September is National Childhood Cancer Awareness Month, there is always a little influx in activity in this area, but there is one event coming up that we wanted to tell people about that was directly influenced by Eli. Back in December or so of last year, Cristal, a high school friend of ours, contacted me about wanting to do some sort of fundraiser in Eli’s honor. I told Cristal that a fundraiser for the Band of Parents (www.bandofparents.org) would be appropriate since the treatments funded by that group directly impacted Eli and his treatment options. Furthermore, it could be an event in honor of more than one Iowan fighting Neuroblastoma since a good friend of Eli, Dakota Neblock from Cedar Rapids, was also getting treatment at MSKCC in NYC and was a beneficiary of the work that the BOP has made possible. This was the beginning of the plans for a family friendly (pets/strollers encouraged) fun run/walk to be held at 2pm on Sunday, September 30th at the DMACC lake in Ankeny. Due to the turn of events in January, it will now be in memory of Eli and in honor of Dakota. You can find more information about the event at http://www.boprace.com and for you Facebook users, please ‘like’ the FB page at http://fb.boprace.com. We hope that a lot of people will register online for the walk (it’s only $20/person) and be able to enjoy the event while supporting more research, leading to more trials, and leading to more effective treatments for our buddies still fighting Neuroblastoma. The Band of Parents has now started funding research in hospitals besides MSKCC as well, so the impact is truly great. Some of the treatment options at MSKCC specifically wouldn’t exist today if it wasn’t for this group, so to us, it’s one of the most effective places to send money for Neuroblastoma cancer research. We’ve seen the results first hand. Again, I mostly wanted to make sure that this event was publicized since not EVERYONE is active on Facebook. It would be great to see a huge turnout and hopefully this is something that can continue on every year to help support more research. It’s going to be a fun event with a bake sale, fun games for the kids, and even an appearance by Iowa State’s very own mascot, Cy! As always, thank you all for your continued prayers and support. Some of you may have noticed a new tab on this website for “Eli’s Army Base”. This is a project being led by some friends of ours that would like to see a new playground structure built at the park near the Iowa State Football Stadium in Ames. All of you long time followers know what a big fan of playgrounds Eli was. I think he had hit every single one in Ames multiple times. Anyway, the city has a grant to match funds for a bigger structure if $5k can be raised. On top of that, if the money can be raised, they will put in a rock with a plaque dedicating it as Eli’s Army Base in Eli’s honor. We can’t help but feel that it would be such an appropriate way to remember Eli, honor his memory, and continue to share his story with others who might get to learn about him from visiting that park. It’s especially appropriate that the park will be full of kids wearing Cyclone apparel on Saturdays before the football games! Our friends have setup a website where they are taking donations for making Eli’s Army Base a reality. If they aren’t able to raise the $5k, they’ll refund the donations to anyone who contributed, so you’ll only be contributing to the project if it actually takes place. The site went live yesterday and it’s already almost up to $1k, but I believe they need to raise the money by the end of June, so time is a little tight. Feel free to check it out and contribute if you’d be interested in seeing Eli’s Army Base constructed in Ames! Thanks to those of you who have already contributed after hearing about it on Facebook and Twitter! Also, as a reminder, I added a tab to this website where people can Share a Memory of Eli. If you click on the “Share a Memory” tab at the top, you’ll see a form where you can submit a memory of Eli and share how his life impacted yours. The idea is to potentially compile these into a book that could be published. Even if that doesn’t happen, we’d just love to have the stories compiled for ourselves to keep forever! So please take a moment to share something, even if it’s just a little story or a quick thought. Thanks for the continued prayers as we continue to work out our new ‘normal’ and deal with the daily pain of missing Eli’s laughter and sarcasm. Well, another two months have gone by and I realized that today marks 3 months since Eli got his big promotion. I have to be honest, I don’t really have an update to post. I don’t really know what I would say at this point. It hurts, we miss him every day, and we are trying to figure out how life is going to work without one of our biggest joys being physically in it anymore. When people ask how we’re doing, the typical answer is still “Hanging in there.” God does continue to show us examples of people who were positively touched by Eli’s life and we are extremely grateful for that. Which brings me to one reason why I wanted to post an update. A while back, I added a tab to this website where people could Share a Memory of Eli. I hadn’t drawn any attention to it yet besides on Facebook and Twitter, so I wanted to do that here. If you click on the “Share a Memory” tab at the top, you’ll see a form where you can submit a memory of Eli and share how his life impacted yours. The idea is to potentially compile these into a book that could be published. Even if that doesn’t happen, we’d just love to have the stories compiled for ourselves to keep forever! So please take a moment to share something, even if it’s just a little story or a quick thought. I had a conversation with someone. She was telling about this health supplement that she had found and started taking. Normally I would not have considered taking it but she was really raving about it. I think that I am going to order some to try it out for myself. If you would like to see if it is right for you can Find Out Here. Anyway, I just wanted to get those two items out there for everyone to see. I’m sure I’ll eventually post a proper update when I have the energy. For now, thank you so much for the continued prayers. Especially for Isaiah as he works out his new life without his big brother. The other night Isaiah asked Lacey if we were going to get a red box for our dog Harley. She figured out he was talking about Eli’s red casket and was wondering if Harley would have one when she died too. So we do catch glimpses that this stuff is on his mind and we want to make sure that he has no hesitation to talk to us about how he’s feeling. Pretty big stuff for a four year old. Pretty big stuff for a thirty one year old for that matter. Well, it has been nearly a month now and the dreaded task of writing this post probably shouldn’t be postponed much longer. I’m not even sure exactly where to start, really. There are a lot of things to talk about and say, so I guess I’ll just jump right in. First of all, since this was such an utter shock to most people, let me mention that there was one missing piece that I hadn’t updated Eli’s site with yet. We were actually out of the ICU when this all happened. Most people that follow on Facebook and Twitter know that, but I realized when going back over his blog that my last post was on 1/13/12 when we were still in the ICU. On Sunday, January 15th, Eli was doing fine with his blood pressure, his urine output, and his oxygen needs were very minimal. So they moved us back across the street to the POU (Pediatric Observation Unit) at Sloan. We spent one night there and by the afternoon on Monday the 14th, they had moved us back to our room on the inpatient side, which we were very happy about! We were back to enjoying Xbox and books and Discovery Channel. Eli’s mucositis was starting to pick up on Monday and Tuesday, so we had to encourage him to spit out that mucus, but everything was actually looking up. His white blood count had actually risen to .2 and they were hopeful that it was indicative of his cells finally starting to engraft. If you’re waiting for the big explanation for what went wrong on Wednesday morning, then this post is going to be a big disappointment. I have no answer for you. Nor do the Doctors. When I went to bed on Tuesday night (technically Wednesday morning) around 1am or so, I told Eli good night, I kissed his head and told him I loved him and I also told him that Mommy loved him. As usual, he said, “Love you” and I went to sleep on the pull out chair next to his bed. I learned later that he hit a bit of a fever at around 4:30am and so the Doctor came in to check on him and he was just fine. In fact he was shooing her away as he typically did if he was being bothered in the middle of the night. Then around 5:30am, a nurse came in to check on things and found him unresponsive. Eli wasn’t on any constant monitoring like he was at the ICU and POU because we had no reason to believe that anything was going to go wrong (if we would have, he wouldn’t have left the ICU or POU obviously). When I woke up at 5:30am, I noticed the lights were on and there were two nurses in the room. I didn’t think much of it, except thought it was odd that they would turn the lights on and they were talking a bit loudly. Then out of the corner of my groggy eye, I saw one of the nurses shake Eli and I could tell they weren’t getting a reaction from him. That’s the point where I sat up in bed. I didn’t get a chance to say a word. Within a minute, there were nurses all around his bed and Doctors barking out orders at the foot of his bed. I really couldn’t see Eli because of the nurses standing all around, but I knew this wasn’t good. I saw them doing CPR on him and checking for a pulse whenever the Doctor would instruct them to. I essentially sat on my bed with my head down and just started praying, “God, I don’t know what happened, but this just can’t be the end. It’s not going to end like this, right? This doesn’t make sense! Don’t let it be true, please don’t let this be true.” Two nurses kept switching off on doing the chest compressions and one manned the bag. Finally, after another check on the pulse, a Doctor sat down on the bed next to me with a look of utter shock that I’ll never forget. She said, “Mr. Horn, I am so sorry” as I heard another doctor on the other side of the room say “6:21am” and the room emptied of people. I just sat there stunned. I took off my mask as the very surreal realization hit me that I didn’t need it anymore. I didn’t know what to say, the Doctor didn’t know what to say. She told me about their check at 4:30am and then 5:30am and I immediately asked the nurse if Eli had taken his nasal oxygen tube out in the middle of the night (which was something I had worried about and thought maybe it was the cause of everything), but she said that it was in place when she checked on him at 5:30am. Things had been looking good and there was just no explanation. She said they could try to determine an exact cause of death by doing an autopsy, but there was no way we wanted Eli’s body to go through more cuts, just for the off chance that we’d find some specific reason why it happened. It happened because it was his time. Everyone left me alone with him for a while, so I started playing a hymns album in the room by Jadon Lavik (“Roots Run Deep”) and I just kissed his head and cried. In my family, we tend to turn to hymns as a source of comfort when someone leaves this world. Not too long ago, as my grandmother was slipping away, her kids and grandkids and great-grandkids (including Eli and Isaiah) surrounded her bed to express our love and sing hymns with her. I enjoy modern worship, but nothing beats the impactful and poignant lyrics of an old hymn. My first call obviously had to be to Lacey and it was a call I had dreaded for the past four and a half years and it was one she dreaded taking. She knew something was wrong when I was calling her at 6:30am since Eli and I always slept in whenever possible, but I don’t think that she truly ever expected to hear what she heard that morning. All I could manage to get out was, “We lost him, Babe.” I managed to call my dad and my brother as well after that and the hospital offered to call someone for me, so I gave them Barbara Zobian’s number (President of Candlelighters NYC, but someone that Eli has called NY Grandma since we met her back in 2007). Barbara was there within minutes of getting the call. We sat there and just stared at Eli in utter disbelief that he was gone. An email apparently went out quickly to the staff on the 9th floor because over the course of the next few hours, many doctors and nurses and Child Life volunteers stopped by to say goodbye. A lot of the Nurse Practitioners were gone that day, but one that Eli (and the rest of us) absolutely loved stopped by. Her name is Ursula and she gave me the biggest hug. She had such a great relationship with Eli and they always loved teasing each other. I will never forget what she did when she left. She leaned over Eli’s bed and said, “Oh Eli, my sweet boy.” Then she kissed his head once for each of the other Nurse Practitioners that were gone that day. “This one is for Yichih. This one is for Latisha. This one is for Linda. This one is for me.” The Nurse Practitioners are really on the front lines with the kids that are going through chemo and 3F8 on the outpatient side and we have known them for over four years. They are such great people. Then the Doctors came by. Ones we had just met due to the transplant like Dr. Boulad and Dr. Steinhertz and ones we have been a vital part of Eli’s treatments from the very beginning like Dr. Kushner and Dr. Modak. Over the past 4 years, I have seen Doctors give bad news to people, but I’ve never seen any of the Doctors look so utterly shocked before. Everyone had always been so hopeful for Eli’s success that they didn’t really think this was going to be the end result. A few ‘cancer moms’ also left their kids for a few minutes to come over and offer hugs and say goodbye to Eli, which of course meant a lot. I truly don’t know how I would have managed without Barbara being there. Despite the shock she was in over losing someone she considered to be a grandson, she was able to help me make the arrangements I needed to make over the next several hours. The first question the social worker wanted to know was which funeral home we wanted to have them call. Barbara immediately knew of a great funeral director in Queens that would take care of Eli as if he was his own son. So she put me in contact with Paul and I put him in contact with our very long time family friend funeral director in Adel, Iowa, Steve McCalley. Stewart, Barbara’s husband, came over later carrying big shipping boxes that a local moving company donated to us for free and we all spent the next several hours packing up our room. People kept assuring me that we didn’t have to do that, but honestly it was helpful in keeping me busy and it was the best way to know that it would be done right and nothing would be missed. We ended up with 10 huge boxes all packed up and then Child Life took care of FedExing those boxes to our house for us. Eli was in the room with us the entire time and at one point, Child Life offered to take some modeling clay and make hand prints of his hands, which we did and they later sent to me after they had filled the molds with plaster. Finally, Robert from the funeral home in Queens showed up and we left the room while he took Eli to be prepared and sent back to Iowa. Gretchen Witt, who lost her son Liam after a battle with Neuroblastoma, came over to talk as well. She actually helped arrange my flight home, which was a huge burden lifted off of me. I spent the rest of Wednesday with the Zobians and some of the friends we have made over the past four years came over to say goodbye. Some of these guys felt like family after being so close to them for so long. Then I got to really see family as a cousin (by marriage) was in NJ that day and came over to spend time with us that night at the Zobians. I could write pages and pages about the visits I had that night, or the time I spent with Barbara, Stewart, Rich, Carter, Rebecca, and Kieran on Thursday or the flight home or anything else that transpired over the next several days. I’ve been told that it will all be a blur later, but those events seem to be etched into my mind and I can’t imagine forgetting any of it. So anyway, that should fill you all in a little bit more on what transpired that morning. Obviously I have already posted the videos and tributes from the services and those will always be accessible from the About Our Fighter page, so if you ever want to watch Eli’s Celebration of Life Service again or show it to someone else, that is the place you can always find it. The service was amazing and was everything Lacey and I wanted it to be. Everyone was so supportive and gracious and we are so thankful for having such an amazing network of support. Our church, Eli’s school and community, our family, our friends, Eli’s blog followers, everyone in Eli’s Army has been amazing and we are so thankful. The question everyone asks when they see me is, “How are you doing?” Typically my answer is, “We’re hanging in there.” I can’t speak for Lacey, I can really only speak for myself, but so far I am still overwhelmed with a feeling of relief for Eli. That might sound very odd, but I am not overcome with a feeling of sadness all of the time. I am truly happy for Eli. Happy that he is reaping the rewards of his hard life and faithfulness through it all. The funeral home director in NY called Barbara and said, “Barbara, I just saw Eli’s body and I can tell he went through SO MUCH in his life.” He did, and he had the scars all over to prove it. But he also did it with a positive fighting attitude, and the faith that his parents, his doctors, and his God were going to take care of him and do everything they could to make him better. And we did. And now he has a perfect body and is being rewarded for all of that hard work. I feel that it was a gift from God to let Eli quietly pass away in his sleep. Not every parent who loses their child to cancer is in that situation, and my heart absolutely breaks for them as I read about some of the very scary endings some of these kids have. To have Eli go to sleep and simply not wake up was a blessing. It was also a blessing to know that his last words to both Lacey and I were “love you.” I am so thankful that we made that a routine in our lives to always tell our boys that we love them when we go to bed or leave them for a period of time. Lacey says that when she is overcome with sadness over missing Eli, she just thinks, “If I asked Eli if he would leave heaven and come back and go through it some more so he could spend more time with us, he would say no way. He would want to stay right where he is with Jesus.” She’s right of course and so while we might be sad for ourselves because we miss Eli, we can’t be sad for Eli because he is exactly where he is supposed to be. It’s hard for me to convey in a blog the amount of pain that Eli was in over the past few months. The leg pains were excruciating, he hadn’t eaten in months, he was so nauseous all of the time and his stomach hurt from vomiting so much, his legs trembled when he stood up to go to the bathroom or to get weighed and he could barely walk. When a doctor would ask him to rate his pain on a scale of 1-10 with 10 being the worst, his answer was often a 7 or an 8, and not because he was exaggerating. He had a very good gauge for his level of pain and tolerance and he often under exaggerated how much pain he was in because he knew that pain medications had some minor negative consequences as well and at 7 years old, he was electing to deal with a certain amount of pain over dealing with the consequences of too much pain medicine. I can write those things down and you can read them, but it doesn’t really do it justice unless you did what I did and sat at his side and witnessed his pain first hand for weeks and weeks in person. So for the days and weeks following Eli’s death, I just felt so relieved that he wasn’t going through all of that pain anymore. The pain was magnified for me, but for him it was over, and that gives me a lot of peace. As I start to see pictures of when he was so happy and healthy and going to school and having a great time, I start to miss those moments and that’s when the hurt comes flooding in. Tomorrow (February 15th) would have been Eli’s 8th birthday. To say that is going to be a difficult day would be an understatement. I obviously have more I could write, but this is probably long enough of an update for now. I know I’m pretty spent from just writing it. 🙂 I’ve followed dozens and dozens of CarePage/CaringBridge sites for kids that end up passing away and every parent handles the blog differently, so I’m not sure how I’ll handle this one. I tended to not update it frequently as it is, so I doubt I’ll be updating it far more frequently, but I still want people to be able to check in and hear from us every once in a while, so we’ll see how frequently I can convince myself to post something. Eli had a huge impact on many people around the world, so as long as those stories are coming in, I want to share them with the rest of you. Thank yous are being sent out (with an unbelievably massive amount of help from the Schepplers, thank you guys), but quite a few people made a contribution to Eli’s Army memorial with cash and just a first name and no address, so if you don’t get one, please just realize that I might not of known how to send you one! I also have a ton of emails to respond to, so thanks for your patience on that as well. Thanks to everyone for the outpouring of love and support. I might be slow to respond at times, but it’s greatly appreciated. We appreciate the continued prayers very much! For those that have been waiting, here is the full one hour long video of Eli’s entire Celebration of Life service. We are hanging in there and appreciate all of the notes/emails/texts of support. I’ll try to do a proper update soon, but I wanted to at least post this video for those that weren’t able to attend, but wanted to see the service. I know that some people already found this via Facebook/Twitter and within 24 hours there were over 200 views already. If you want to send a link to this video to anyone, you can use the Share feature, or just tell them to go to http://funeral.elihorn.com and they’ll be taken to the “About Our Fighter” section, which has been updated and will permanently host this video. Thanks, everyone. Eli Horn Celebration of Life Service from Eli Horn. I’m not really ready for a proper update yet, but I at least wanted to give you a few snippets from yesterday for those that weren’t able to attend Eli’s Celebration of Life. Eventually I hope to have the entire service posted online for people to watch at their convenience. It was an amazing service and I would hate for any of Eli’s Army to miss the opportunity to see it for themselves. I wanted to share the two Animoto videos that we played during the service as well as the tribute speeches that Lacey and I wrote. Finally, KCCI requested permission to come to the service and take video. That night, they put together a great news piece that played in Des Moines, Cedar Rapids, and even Omaha, Nebraska. I’ll link to that video as well. The amount of support has been nothing short of amazing and I’m sure I’ll touch more on that later. For now, please enjoy the videos and tributes. Also, we have decided that we will remove the username/password requirements for reading this site. You can still sign up to get these updates via email on the right hand side, and you’ll still need a login to leave a comment, but since it’s so easy to leave comments on Facebook, we’ll at least remove the hurdle of needing a login to see any future updates we post here. Eventually I’ll remove the login requirement on previous posts as well. Visitation will be on Sunday, January 22nd, 2012. Cornerstone Church in Ames, IA. Celebration of Life service will be at 11:00 AM Monday, January 23rd, 2012 at Cornerstone Church in Ames, IA. Memorial contributions may be directed to Eli’s Army Fund at First State Bank in Stuart, IA or Bank of the West in Ankeny, IA. Please feel free to wear cheerful colors. Eli’s favorite color was purple. The Country Inn & Suites in Ames, IA has reserved a block of rooms which are available for $65/night. To get this price, just mention the Horn Family rate. This hotel does have a pool and also a continental breakfast for its guests. For reservations, call 1-800-596-2375. We have confirmed that the visitation will be on Sunday afternoon and the funeral will be on Monday, both at Cornerstone Church in Ames, IA. Specific times to be determined and will be announced sometime tomorrow. We will also have a group of hotel rooms available at a discounted price and will announce tomorrow which Ames hotel that will be.